The Heddon Super Spook sets itself apart with its super stout hardware system. The standard 5-inch Super Spook comes with three super-sharp hooks perfect for schooling stripers! 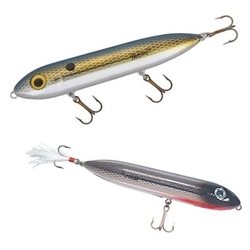 The Super Spook Jr. is slightly smaller at 3-1/2" 1/2oz, and uses it "walk-the-dog" action to make it a favorite of pike, striper, speckled trout or redfish anglers. You can get the Jr. with or without a dressed feathered hook. Quantity Size Jr. Feathered Jr.